The oral cavity functions as the interface between the respiratory/digestive tracts and the outside world. It contributes to a complex array of functions that include speech, mastication, salivation, early digestion, and oral/oronasal competence. Tumors of the hard palate are uncommon. Resection of the hard palate may be necessary for the management of benign or malignant tumors or as a donor site for a mucosal graft. Pleomorphic adenoma of hard palate in Asian woman. When used as donor grafts, hard palate tissue offers the advantages of an epithelial lining, minimal postoperative graft shrinkage, and ready availability compared to other donor sites/materials. Although it is a stiff graft, it is moist and flexible, thus allowing appropriate functioning as a tectonic support in facial reconstruction such as in the lower eyelids, lower lip, nasal ala, and in mucosal defects in oral surgery. [5, 6, 7, 8, 9] The hard palate mucosa exists as a keratinizing squamous epithelium on a dense, collagenous lamina propria, very similar in structure to native tarsus in the eyelid. The indications to perform hard palate resection include excision of malignant and benign tumors, to alleviate complications from tumor burden that compromise the function of the oral cavity, and for facial reconstruction such as in cases of eyelid, lip, and nasal ala deformities. Contraindications to hard palate resection include inability to tolerate general anesthesia, extensive lesions that may require more radical surgical intervention, and tumors that may be more appropriately treated with local irradiation and/or chemotherapy. The oral cavity (see the image below) is oval shaped and is separated into the oral vestibule and the oral cavity proper. It is bound by the lips anteriorly, the cheeks laterally, the floor of the mouth inferiorly, the oropharynx posteriorly, and the palate superiorly. 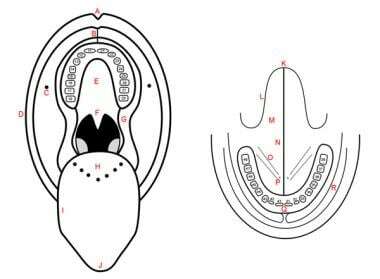 The oropharynx begins superiorly at the junction between the hard palate and the soft palate, and inferiorly behind the circumvallate papillae of the tongue. The bony base of the oral cavity is represented by the maxillary and mandibular bones. The palate is the horseshoe-shaped, domed roof of the oral cavity. It is divided into a hard portion and a soft portion. The hard palate belongs to the oral cavity and separates it from the nasal cavities. The soft palate belongs to the oropharynx and separates it from the nasopharynx. For more information about the relevant anatomy, see Mouth Anatomy. Examination under general anesthesia is usually necessary for tumor mapping and surgical planning. Consultation with an experienced anesthesiologist is useful to ensure safe intubation that allows appropriate exposure of the surgical field while not compromising the patient's respiratory status during the case. Paralytic agents may help to improve oral cavity exposure during the case. Local anesthetic with vasoconstriction is often used around the resection site to improve hemostasis. The patient is placed in the supine position with the head stabilized in a doughnut holder. Prophylactic antibiotics (to cover gram-positive and anaerobic organisms) are often given during the induction of general anesthesia and continued for at least 48 hours postoperatively. Anticoagulation is stopped or bridged when medically appropriate. A mouth gag is inserted to retract the tongue and endotracheal tube away from the surgical field and to provide optimal visualization of the mouth. If necessary, malleable cheek retractors can be used to improve the view. The periphery of the lesion is noted visually or marked graphically. Local anesthetic with vasoconstriction is injected along the surgical plane to promote hemostasis. An incision down to the periosteum with wide margins away from the peripheral extent of the lesion is performed to allow for tumor-free surgical margins. Periosteal elevators are used to lift the tissue and allow bone-cutting instruments to be introduced in such a way to avoid nearby soft tissues. If bone resection is needed, the area to be resected can be isolated with an oscillating saw or high-speed Midas Rex drill. After the lesion has been circumscribed by bony cuts, the specimen can be rocked free and excised. Frozen section examination of the surgical specimen is often necessary to ensure complete surgical removal. For squamous cell carcinomas of the hard palate, the regional lymph nodes must be carefully inspected. Although the rate of occult metastases in hard palate cancer is lower than in most other oral cavity subsites, advanced-stage (T3 and T4) tumors do have a significant risk of occult metastases and elective neck dissection should be considered. For hard palate mucosal grafting, the prospective donor site is marked and injected with local anesthetic with epinephrine. The nasopalatine neurovascular bundle and the greater palatine vascular bundle may be anesthetized for further post-operative pain control. The hard palate mucosal donor site is infiltrated with local anesthesia. The graft is harvested by outlining the mucosal site, staying lateral to the median raphe with a cutting Bovie on a sharp pointed tip such as a Colorado needle. The graft is harvested using a right-angle sharp blade such as a super blade or crescent knife or #57 beaver blade. The graft is undermined, but an attempt is made to keep it thin. Hemostasis is obtained with cautery or a pressure dressing. Hard palate reconstruction can be performed using a variety of reconstructive modalities. Consideration as to the type of defect is essential in selecting an appropriate reconstructive option (Table 2). Reconstruction of defects involving less than one third of the hard palate may be perfomed using local flaps, such as palatal island flaps and buccal mucosal flaps. Larger defects, however, require more extensive reconstruction, including the use of free flaps. Fasciocutaneous free flaps may be used for patients with defects greater than one third of the hard palate or for smaller defects within a previously irradiated field. Other free flaps, including radial forearm free flaps and anterolateral thigh flaps, can be used for patients who will require dental rehabilitation, as both are pliable flaps and can accommodate dental prosthetics. For defects of larger volume, myocutnaeous flaps, including latissimus dorsi and rectus abdominus flaps, can be used and are helpful in maintaining contour of the cheek. Osseocutaneous flaps can be used for defects with significant bony loss. Radial forearm osseocutaneous flaps may be considered in patients with defects involving most or all of the maxilla with loss of the premaxilla and nasal spine. Fibular free flaps can be of use for defects involving the tooth-bearing maxillary alveolus including one or both canines or if the defect is greater than 50% of the palatal surface. Near-total or total maxillectomy defects can be reconstructed using subscapular vessel-based flaps. As with other surgical procedures, excessive bleeding and postoperative infection remain the most commonly feared complications. Surgical planning to avoid damage to local structures, potentiate missed tumor margins, and ensure oronasal competence is necessary for optimal recovery. When used for facial reconstruction, hard palate grafts may not completely reapproximate native tissues. Proper handling of grafts is necessary to prevent tissue extrusion and compromise of the graft's integrity. Patients are followed closely during the postoperative period to avoid the previously mentioned complications and/or to treat them aggressively when they occur. In the case of tumor resection, direct inspection of the resected site is necessary following surgery, along with palpation of lymph nodes of the head and neck during the period of surveillance. In this respect, a potential advantage of prosthetic obturator reconstruction is the ability to carefully inspect the surgical site for local recurrence. When grafted, the reconstructed area is examined for areas of tissue necrosis that may indicate failure and/or rejection. Byron J. Bailey. Atlas of head & neck surgery--otolaryngology. Bernhart BJ, Huryn JM, Disa J, Shah JP, Zlotolow IM. Hard palate resection, microvascular reconstruction, and prosthetic restoration: a 14-year retrospective analysis. Head Neck. 2003 Aug. 25(8):671-80. [Medline]. Morris LG, Patel SG, Shah JP, Ganly I. High rates of regional failure in squamous cell carcinoma of the hard palate and maxillary alveolus. Head Neck. October/2010. Patel SG, Shah JP. TNM staging of cancers of the head and neck: striving for uniformity among diversity. CA Cancer J Clin. 2005. 55:242-258. Vecchione TR. Palatal grafts for lip reconstruction. Ann Plast Surg. 1983 Apr. 10(4):301-5. [Medline]. Ito, S. Suzuki and S. Park et al., Eyelid reconstruction using a hard palate mucoperiosteal graft combined with a V-Y subcutaneously pedicled flap, Br J Plast Surg 54 (2001), pp. 106-111. An evaluation of hard palate mucosa graft as a lining material in alar reconstruction: a 7-year experience applied to the full-thickness alar defect. Hatoko M, Tanaka A, Kuwahara M, Tada H, Imai K, Muramatsu T.Plast Reconstr Surg. 2000 May;105(6):1940-7. Gullane PJ, Arena S. Palatal island flap for reconstruction of oral defects. Arch Otolaryngol. October/1977. 103:598-9. Walter F. Thumfart. Surgical approaches in otorhinolaryngology. Okay DJ, Genden E, Buchbinder D, Urken M. Prosthodontic guidelines for surgical reconstruction of the maxilla: a classification system of defects. J Prosthet Dent. October/2001. 86:352-63.
van der Sloot PG. Hard and soft palate reconstruction. Curr Opin Otolaryngol Head Neck Surg. 2003 Aug. 11 (4):225-9. [Medline]. Chen C, Ren W, Gao L, Cheng Z, Zhang L, Li S, et al. Function of obturator prosthesis after maxillectomy and prosthetic obturator rehabilitation. Braz J Otorhinolaryngol. 2016 Mar-Apr. 82 (2):177-83. [Medline]. [Full Text]. Mittal M, Sharma R, Kalra A, Sharma P. Form, Function, and Esthetics in Prosthetically Rehabilitated Maxillary Defects. J Craniofac Surg. 2018 Jan. 29 (1):e8-e12. [Medline]. Genden EM, Wallace DI, Okay D, Urken ML. Reconstruction of the hard palate using the radial forearm free flap: indications and outcomes. Head Neck. 2004 Sep. 26 (9):808-14. [Medline]. Rolski D, Kostrzewa-Janicka J, Nieborak R, Przybyłowska D, Stopa Z, Mierzwińska-Nastalska E. Prosthetic Rehabilitation of Patients After Surgical Treatment of Maxillary Tumors with Respect to Upper Airway Protection. Adv Exp Med Biol. 2016. 885:83-8. [Medline]. Chen C, Ren WH, Huang RZ, Gao L, Hu ZP, Zhang LM, et al. Quality of Life in Patients After Maxillectomy and Placement of Prosthetic Obturator. Int J Prosthodont. 2016 Jul-Aug. 29 (4):363-8. [Medline]. Hard palate mucosal grafting: A) A bite plate or silicone block is used to stabilize the mouth. B1) The prospective donor site is marked and injected with local anesthetic with epinephrine. The nasopalatine neurovascular bundle is avoided, and the greater palatine vascular bundle is also avoided. B2) The hard palate mucosal graft is infiltrated with local anesthesia with adrenaline--allow 2-5 minutes for vasoconstrictive effect. C) The graft is harvested by outlining the mucosal site with a cutting bovie on a sharp pointed tip such as a Colorado needle. D) The graft is harvested using a right angle sharp blade. The graft is undermined, but an attempt should be made to keep it thin. E) Hemostasis is obtained with cautery or a bone wax pledget. F) Immediate appearance of the hard palate mucosal grafting site. G) Appearance 1 month after surgery. Intraoperative photograph of a hard palate graft being secured between the inferior tarsal plate and lower lid retractors, right eye.